So I've been sick these past few days, and the only good thing about being bedridden was getting to plow through some books and catch up on my 2011 goal (I'm so close - I might be able to make it!) 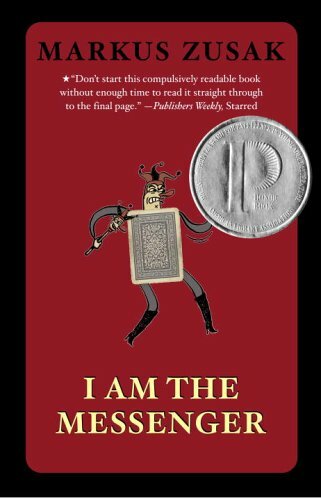 One of the books I had the pleasure of reading was I Am the Messenger. Many of you may recognize the Zusak's name from his highly popular book The Book Thief from a few years ago. (If for some reason you haven't read that beautiful book go read it now). Well this book was written before The Book Thief and is just as well written/thought out/ Gorgey McGorgeouson as his most popular novel. Synopsis! Ed is an underage cab-driver who lives in the suburbs of Sydney. His life isn't going anywhere special. The girl he loves refuses to fall in love with anyone and has put him in the "Best Friend" position. His mom hates him. He wants more. One day he becomes a hero when he finds himself in a bank-robbery and has had enough and he chases the robber down. After that an Ace of Diamonds shows up in his mailbox with 3 addresses on it. And Ed has to figure out what to do. Why I really loved this book: Ed is a really nice guy and he doesn't realize it. The entire book is about him realizing it. The Aces he's sent are cryptic and kind of creepy, but he goes along with the plan because he knows that they are the key to helping him figure out his life. Before they were in his life he was content with doing nothing. After they started showing up he started noticing the people around him and started helping them. I think that's what I really enjoyed about this book, is that Ed helped the people in his community and asked for nothing back. Honestly, even though this is not a Christmas story - it was a perfect book to read around Christmas. It filled me with joy and hope and all those things that Christmas is supposed to be about. It is an incredibly enjoyable book and a quick read (even if you aren't bed-bound it would probably only take a day to read). I highly recommend it to everybody. And The Book Thief. Stop reading this review. Go read these books instead. The only thing that kept me from giving it a 5: It kept mentioning meat pies and I started craving them really badly. Seriously, I wish they were available in the States. sigh. But actually - I don't know what kept me from giving it a 5, maybe the fact that I'm really stingy with my ratings and I only give out 5s to a very select few books. i loved this book. LOVED IT. Markus shared a bit more about his I Am The Messenger thoughts with me. and i share them with you here. I LOVE this book. I just read it over the summer and it was fantastic!! I read this book over the summer and really enjoyed it too. What really trows me off about Zusak works are how they are labeled in the US as YA. Not that there is anything wrong with YA, but both this and The Book Thief read are more adult books to me.. I love this book. I read it twice from my local library and then I bought my own copy. I've heard this book mentioned once or twice. Your review definitely makes me want to add this to my list (as well as The Book Thief). I love the premise of this book, it definitely grabs my attention! Great review!! I read this book a while ago, great summary. It's fine to be highly selective! I'm ridiculously selective as well, and it's gotten me a reluctant place on editing boards, all of which are very enjoyable. I really liked this book and keep meaning to reread it. Also, there ARE meat pies in the South. Just so you know!